Nabisco owns the Oreo brand. They are the same company behind Ritz crackers, Triscuit, and Chips Ahoy. As recently as a few years ago, Oreo held 40% of the cookie market. It’s America’s iconic snack cookie. 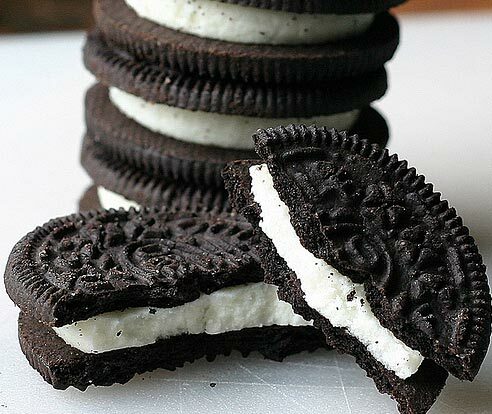 Face it—if you don’t feel like making cookies at home, the first grocery variety that pops into your head is the cream-stuffed Oreo. Sugar, enriched flour, canola/palm/soybean oil, alkali-processed cocoa, high fructose corn syrup, cornstarch, leavening, salt, soy lecithin, vanillin, chocolate. If you’re interested, Smitten Kitchen has a great writeup on making homemade Oreos. I’ve tried this recipe before and it turns out very well. However: Sugar overload.